New year, better Shift. We’re kicking off 2019 with a bang and 120 new apps in Shift! Browse our latest additions to the App Directory below. Now available on all Shift Advanced accounts! 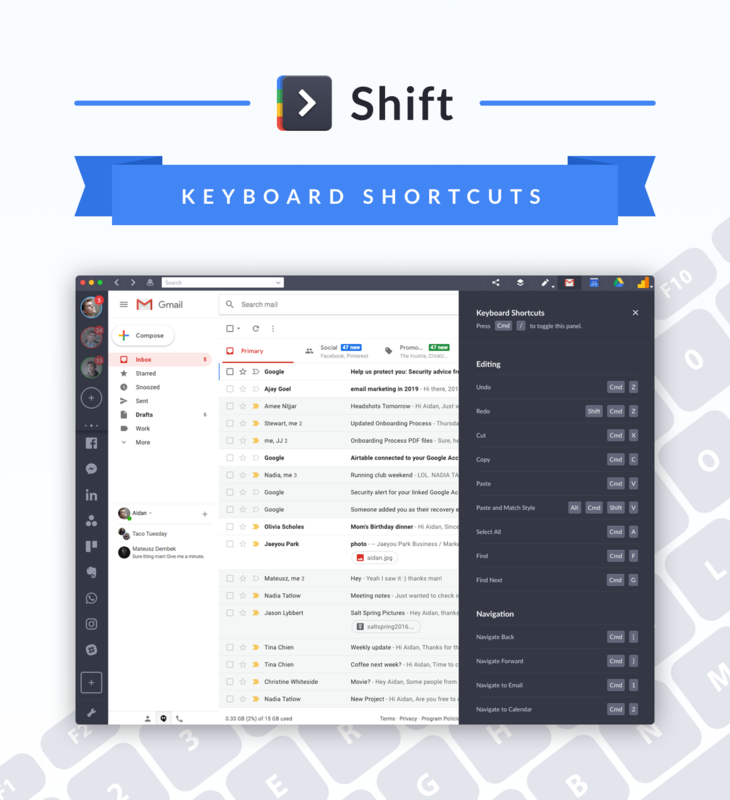 Cycle windows, check email, browse Drive, and view your calendar with a few simple taps on your keyboard with Shift custom keyboard shortcuts. And to make things really simple, use the shortcuts Cmd/Ctrl + / to access our new Keyboard Shortcut Legend for a quick reference on the go. You can now copy the URL of an External Shift Window and share it as you please. Now, you can access Google’s suggestions feature when typing in the address bar in Shift. Now, users in the rest of the world (apart from the US) have the option to add their country’s version of eBay and Amazon in Shift. Add your custom Gitlab URL and manage it all from right inside Shift. Resolved: Mailtrack is now updated to the latest version and working as expected in Shift. Resolved: Now you can send emails with confidence knowing that Grammarly and Shift have your back. Resolved: Shift customers can now attach and send photos in Google Hangouts. Resolved: Print your Google Calendar events with ease from right inside Shift. Resolved: Clicking Mailto links now work as expected and open Shift to display an email compose window addressing the correct email. The option to “Remind Later” under the “Remind Me” function in Mixmax is cutoff in Shift. Resolved: Now, Mixmax users in Shift can view and select the option to “Remind Later” in Mixmax in Shift. Resolved: Now, users can use keyboard shortcuts in Slack within Shift without first clicking on the window. Receiving a new message in private channel that was left open in Slack is not reflected in the app unread count. Resolved: Slack unread counts in Shift now reflect the accurate number of unread messages. Resolved: Now, clicking a PDF in Asana opens within Shift as opposed to opening in the browser. Resolved: Mute notifications and stay in the flow without being interrupted by unwanted Telegram notifications in Shift. Resolved: Using the Cmd/Ctrl + T shortcut within an app works as expected and does not cause Shift to render unresponsive.